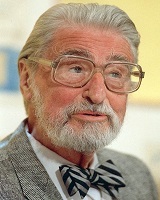 Theodor Seuss Geisel 2 March 1904 24 September 1991 American Theodor Robert Geisel Henrietta Seuss Geisel Screenwriter, Author, Illustrator, Television producer, Poet, Songwriter, Film Producer, Animator, Visual Artist Cartoonist and writer, he published over 60 books. His children's books like 'The Cat in the Hat' and 'Green Eggs and Ham' were some of his most famous works. A list of popular Hindi Theodor Seuss Geisel quotes are given below.